This is the the basic hurdle; to leap over it you have to be able to create the program text somewhere, compile it successfully, load it, run it, and find out where your output went. With these mechanical details mastered, everything else is comparatively easy. Click the add page icon, enter the name “hello.html”, then click Create. 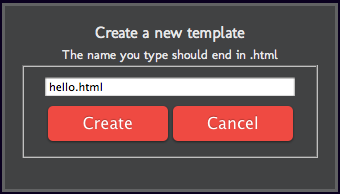 Click the Save button, then click the file name “templates/hello.html” at the top of the editing pane. This completes Kernighan’s exercise. Save and test. Clicking the button should now open a dialogue box saying “Click!”. The strange looking line starting with a dollar sign is a jQuery statement. Rascal includes the jQuery library whose motto is “write less, do more”. Here we are using it to capture the button click and do something. Python is quite fussy about indentation so if you haven’t used it before, it might be best to copy and paste this code. This function tests whether the LED is already on (the value of the pin is 1) and if so turns it off (set_pin_low), otherwise it turns it on. It also returns a message saying whether the LED is off or on which we can ignore for now. After editing server.py, you need to do two things – click the Save button and then click Reload pytronics. 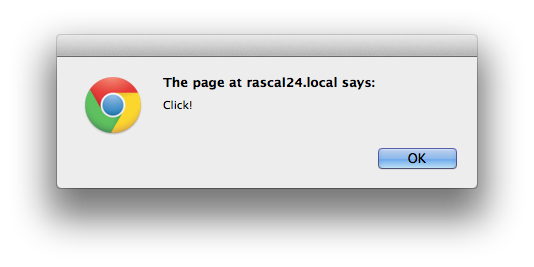 The latter restarts the Rascal web server so that it uses the new version of server.py. Save and test. Clicking the button should turn the Rascal’s second LED on and off (this is the LED at the opposite end of the Rascal board to the Ethernet connector). 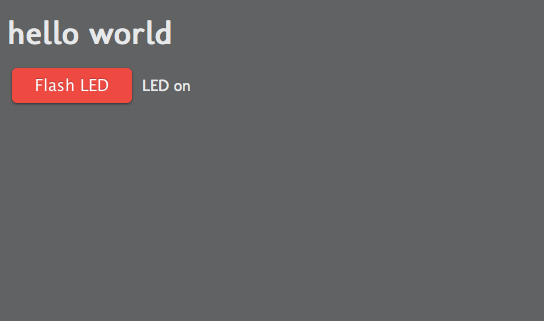 To make the button flash the LED, we added another jQuery statement $.post() which sends a request to server.py. This completes the embedded systems version of “hello world”. Save this change and make sure that the alert message is correct. This new jQuery statement replaces the text in the <span> tag with the post response.